As the second in the series of ANTaR ACT Read and Discuss events, Samantha Faulkner and Joyce Graham joined us to talk about their journey as authors and with the Us Mob Writers group, which published the anthology Too Deadly – Our Voice, Our Way, Our Business in 2017. Here are some notes from the discussion. Us Mob Writing evolved from the ACT Indigenous Writers Group, founded in March 1999 by Jenni Kemarre Martiniello. Since then, they have held creative writing courses, hosted a conference, held oral history workshops, performed at a range of venues and festivals (including the 2014 ANTaR ACT David Hunter Memorial Lecture) and continued with regular meetings and workshops. They also published an earlier anthology By Close of Business in 2013. Joyce Graham is a Kamilaroi writer, from Moree, and has been in Canberra for many years. She is currently manager of the Aboriginal Liaison Officers at the Canberra Hospital. Joyce talked about how she came to art through her healing process. She is inspired by the Us Mob Writers and enjoys dabbling with new ideas and challenges with the group, such as her recent experiments with haiku. She also often finds inspiration in nature. The poem below is a reflection on identity. Wadda ya think it is? “Wait for me,” I yelled running after him. 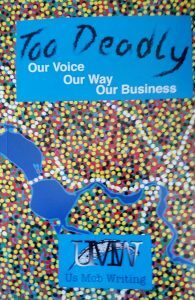 Us Mob Writing received a grant from the Australia Council for Too Deadly. With the grant they held master classes and writing retreats (including working with Melissa Lucashenko), and the anthology brings together the work of the authors from those activities. The editing was initially done internally and then sent out to external editors, who provided very valuable feedback, and a different perspective. Joyce talked about how this process helped them explore new ideas and approaches – within the book, Growing is her first story. Sam talked about the inspiration she gets from being part of the group. The group has many plans for the future – they are looking at getting a website together, and are sharing stories at festivals and events. Members will be performing at the poetry evening at Smiths Alternative on Reconciliation Day, Monday 28 May 2018. They are also happy to come and talk to schools and groups. You can contact Us Mob by email to Kerry Reed-Gilbert kuracca@bigpond.net.au, and see https://www.arts.act.gov.au/cbr-arts-showcase/us-mob. We greatly appreciated Samantha and Joyce coming to share their stories with us. We learnt so much and lovely to understand more about the writing process and the inspiration and creativity that leads to such beautiful poems. Poems reproduced with permission of the authors. A collaboration between New Zealand’s Maori literary journal Ora Nui and the First Nation Australia Writers Network (FNAWN) this special edition of Ora Nui showcases a range of poetry, prose and short fiction from the Indigenous people of the Antipodes – Maori from Aotearoa New Zealand and the Aboriginal and Torres Strait Islander people of Australia. New writings from some 50 contributors. Edited by Anton Blank and Kerry Reed-Gilbert. Hi, just wanted to amend my surname in the above – should be Samantha Faulkner. Thanks. Joyce and I enjoyed the evening also. Thanks – so sorry – corrected now.